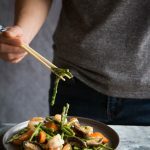 Learn how to make a perfect asparagus stir-fry with shrimp and other veggies. This will become your favorite and easy weeknight meal solution. Can be a side dish or an entree. Pat the shrimp dry with paper towel, set aside. Peel off tough skins from the asparagus and trim off about 2-3 inches of the tough bottom parts. Cut into 2 sections.